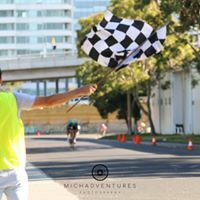 The SKCC 2018-2019 Summer Criterium Season is held on most Sunday mornings between October 2018 and March 2019 in South Melbourne. Registration and the start finish is on White Street (Melways ref 2E F11). Parking is on Boundary Street. Google Maps Link http://g.co/maps/fnx8y. Pre-entries will close at 6pm on the Saturday evening before the event. Pre-entries for the following Sunday’s event will open at midday the Sunday before. Q. If I don’t get around to pre-entering can I still register and pay on the day ? A. YES (but we really want you to start entering online by 6pm the evening before. Plus it’s cheaper to pre register). Q. If I pre-enter then can’t make it on the day, do I get a refund ? A. Yes, if you can’t make it on the day you will receive a refund or a credit, no questions asked. But you must send an email to grading@skcc.com.au with your preference (refund or credit) before 1pm the Wednesday following race day or risk losing your refund. (NB: IF you choose a credit you need to know which race day you wish to transfer your credit to). If you do not select credit or refund, as a default, a refund will be processed. Q. If it rains and my grade is cancelled, do I get a refund ? Q. How do I claim my race number ? A. On the day there will be a separate race desk set up with race numbers and a start list in alphabetical order. Find your name, find your number, hit the start line in time for your race briefing. Who Can Race and What Do I Need? Anybody can race with a current (UCI) racing licence (Cycling Australia or International). The first time you race you will need to complete an online GRADING FORM. Information regarding grades, which grade to enter, and SKCC grading policy can be found HERE. If asked all riders MUST show a valid licence OR proof of renewal (i.e. printout/PDF of online renewal). SKCC adopts a strict “No licence, no race” policy. If you forget your licence, or proof of licence you can purchase a 3 race licence. The registration desk closes five minutes before each race start time (see below). What If I Don’t Have a Licence? You can can purchase a Three Race Licence from Cycling Australia. Like many, if you fall in love with SKCC and choose to take out a full licence, the cost of the Three Race permit price comes off the cost of an upgrade to a full licence. Why Is SKCC Criterium Racing So Popular? Michael from Soul Kitchen will be selling great coffee, brownies, muffins, drinks and other yummy snacks. Club extroverts call the races, sometimes in Spanish for that Euro feel! We provide toilets, there are plenty of seats for spectators and heaps of parking on Boundary Street. What If I Have Never Raced Before? First of all read our First Time Guide to Criterium Racing and Your First Race. SKCC offers “E” (ENTRY) grade every Sunday. E Grade is intended for people with little or no race experience. E Grade is supervised by experienced Total Rush sponsored riders who will assist with riding and racing skills. The first 20 minutes is under ‘control’ (not actually racing). So it’s a great opportunity for new riders to gain confidence, race experience and meet some fellow newbies!